On the surface, the concept of a flat tax sounds good—it would simplify tax preparation and lower most people’s taxes. However, according to Scott E. Hicko, a flat tax would increase taxes for the average worker and destroy the American dream. Under such tax legislation, the super wealthy would pay less tax while the nation’s working class would carry the nation’s tax burden. First introduced in the 1970s, the flat tax concept will continue to be debated as the government seeks ways to streamline, says Hicko. And most people do not understand the realities of it. 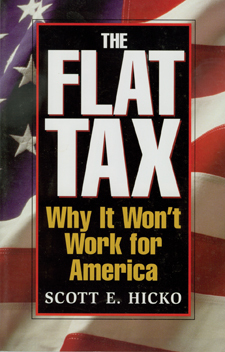 The Flat Tax: Why It Won’t Work for America is the first book to outline the negative impact a flat tax would create on the American economy. Author Scott Hicko, a certified public accountant, has twenty-five years experience in working with the American system of taxation. He’s defended clients in thousands of collection and taxation issues against the Internal Revenue Service.